Low prices. OrangeSmile.com offers car hire service in Spain on the lowest-rate-guarantee basis, since we work with car suppliers directly. For your search criteria in Spain, we always select and show the best rental offers. The car reservation process consists of 3 simple steps: (1) search for available cars for your dates in Spain; (2) select your car type; and (3) fill in the booking forms. Once the reservation is completed, you will receive a confirmation voucher to your email address. During the booking process, please check your rental conditions. To pick up your car at the rental point in Spain, you need to provide our confirmation voucher, your driving license and a valid credit card. The final payment is normally carried out at the pick-up point. Our car hire points in Spain accept VISA, MasterCard, etc - please check your rental conditions. At the pick-up point, please read the handling manual and check the car for present defects. OrangeSmile.com wishes you a pleasant journey to Spain! The car hire reservation system OrangeSmile.com allows renting a vehicle in Spain within 10 minutes. Our largest database of car suppliers enables us to provide you a rental car in Spain at the cheapest rate ever possible. At rental locations in Spain we offer the following car sizes: mini, compact, economy, standard, premium and luxury. The following car types are available in Spain: Sedan, Hatchback, Jeep, Cabriolet, Coupe, Minivan and Minibus. Spain is famous not only for its rich historic heritage, but also for great choice of entertainment and unparalleled atmosphere of hospitality. Buildings constructed yet during the Roman Empire times are considered the main architectural landmarks of the country. In big cities of Spain travelers will always find museums of history and archaeology, art galleries and exhibition halls. Casa Mila, La Pedrera, which is located in Barcelona, might be the most famous architectural place of interest in the country. The name of the building can be literally translated as "the stone cave". The building was constructed according to the project of Gaudi and was controlled by the famous architect. It's worth mentioning that all works of Gaudi are distinguished by original and unusual design. According to initial project, Casa Mila La Pedrera was intended to be made solely from curvilinear elements and slanting partitions, but later the architect changed his original thoughts and built a unique house that has absolutely no load-bearing walls. This is the only building in the country, where even balconies have an important construction rather than decorative role. 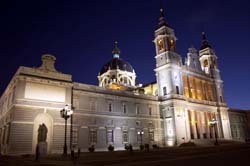 The Royal Palace remains the main landmark of Madrid. Nowadays, the palace is used to host most important meetings and official ceremonies. An ancient Moorish castle stood on the site of the modern Royal Palace until 1755. In the middle of the 18th century the castle lost its strategic importance, and as it was built in a very beautiful place it was decided to demolish it and build a luxury palace instead. Currently, this magnificent building has more than 2,000 rooms halls that hold precious collections of old items - chandeliers, clocks, furniture, musical instruments, weapons and artworks. The city of Seville is a very interesting place from a historic point of view. The city is also rich in numerous historic and cultural landmarks. Santa Maria Cathedral is worth a separate mention. The cathedral is a beautiful example of architecture of the 15th century. Construction of the sanctuary started in 1402 and lasted almost a hundred years. The decoration of the facade and creation of frescoes inside the church took the majority of time. Travelers are welcome to see the result of such hard work. In the cathedral they will see beautiful statues, grandiose main altar and the Royal Chapel decorated with gilding and elegant drawings. The cathedral is built on a site of an ancient mosque, and it's still possible to see the remains of the original building. It's a small square named Orange Yard, which is surrounded by a big park and is perfect for walks on a hot day. If you need to take or to return a car at night, it is better to search for a vehicle in airport locations (downtown offices in Spain usually do not work at night). On delivery of the rented vehicle in Spain, please make sure that the rental company has no claims concerning the car, and all the documents and the invoice are provided to you in a printed format.